Travel just 15 minutes from Deep Creek Lake to experience some of Maryland’s most breathtaking scenery. Swallow Falls State Park is a popular destination for its waterfalls, kid-friendly trails and towering hemlocks. There is also a fascinating history to note: the area had three very famous visitors walk its paths. In 1927, Henry Ford, Thomas Edison and Harvey Firestone set up camp together at present day Swallow Falls State Park. The visit by these three self-proclaimed “vagabonds” drove the area to public recognition and led the movement to protect and promote forest conservation and outdoor recreation in Maryland. The park serves as a retreat for tourists and locals while also reminding us what a privilege it is to be able to enjoy these public lands. Read on to discover more about the attractions at Swallow Falls State Park. Hike along the Youghigheny River in Swallow Falls State Park and observe the changing nature of its beauty. The only officially designated Wild and Scenic River, the Youghiogheny acts as a watershed from the western slope of the Appalachian Mountains and encompasses approximately 397 miles in Maryland. Within Swallow Falls State Park, the river offers dramatic drops in elevation complete with falls, rapids and dense forestation. After witnessing the beauty of the Youghiogheny for itself, you will remember its name even if you can’t remember how to spell it! 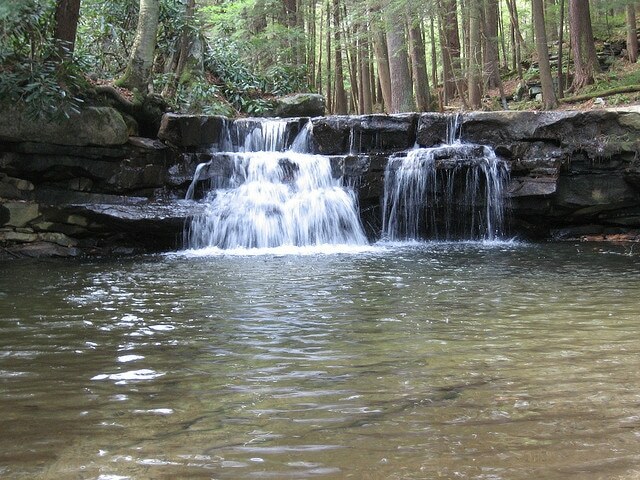 The oldest grove of white pine and eastern hemlock in Maryland resides in Swallow Falls State Park. The tall hemlocks, some more than 300 years old, tower over park visitors and remind them of medieval European forestry. To fully experience the encompassing hemlocks, take the five-and-a-half mile trail from Swallow Falls State Park through Garrett State Forest to Herrington Manor State Park. Muddy Creek Falls is the iconic center point of Swallow Falls State Park. Significantly taller than the other two falls in the area, Tolliver Falls and Swallow Falls, Muddy Creek Falls crashes down 53 feet from top to bottom. The brave can play in the water beneath the falls and all can appreciate its beauty. For a waterfall swimming experience that all ages can enjoy, Tolliver Falls in Swallow Falls State Park is a great destination. While the falls are only about five feet tall, they offer a 20×20 foot pool for wading and swimming. The beach and sandy bottom of the falls offer a safer place to play than the rocky subsurface of Muddy Creek Falls, but caution should still be exercised on wet rocks to avoid slipping. Swallow Falls State Park offers all of these fascinating attractions and more, but perhaps its most important contribution is its historical significance. We cannot take for granted the value of public lands to relax, renew and revitalize. Here at Lake Pointe Inn, we take relaxation and revitalization to heart by offering our guests the best in luxury appointments and modern conveniences. A variety of massage treatments are also available to our guests, so the renewal process doesn’t have to end after your waterfall swim at Swallow Falls State Park. You can return to the comfort of our Deep Creek Lake bed and breakfast and continue your relaxing Maryland retreat at Lake Pointe Inn. Photo courtesy of Bob Usselman.